There isn't one little girl who did not enjoy growing up with Disney Princesses. The two most popular princesses from Disney are Cinderella and Snow White. When girls were younger, they loved to listen to bed-time stories about their favorite princesses. But there really isn't any more pleasure than seeing Cinderella and Snow White come to life in real color and motion. There is something so inspiring about the stories of these two Disney princesses and their Prince Charming that make them loved by girls and even adults of all ages. 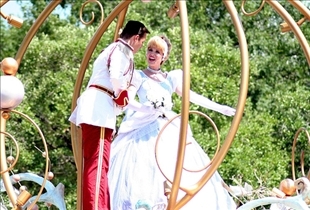 Cinderella's rich father marries a haughty woman with two daughters from her previous marriage. When Cinderella's father dies, her stepmother and stepsisters begin to maltreat her. Meanwhile, the country's Royal prince has to look for a lady to marry. So the King organizes a ball to be attended by all the ladies in the land. Cinderella goes to the ball with the help of a fairy god mother, who makes her promise that she needs to leave the ball before midnight. Cinderella is the most beautiful lady in the ball, and the Prince falls in love with her. When she leaves she forgets one of her slippers. The next day the prince sends out his people to search for the lady who owns the glass slipper. The Prince finds Cinderella despite her step mother's attempts to lock her up and hide her. Snow White, a beautiful princess has to live with her cruel stepmother, a wicked witch who is envious of the young princess's beauty. The witch has a mirror who would always tell her she is "fairest one of all". Once, the mirror tells the queen that Snow White is the fairest, so the queen orders a huntsman to kill the maiden and bring back her heart. Snow White begs for her life, so the huntsman brings back a pig's heart instead. She finds a group of dwarfs who warm up to her because she cooks and cleans for them. The Queen discovers that she is still alive and disguises as an old woman who sells a poisoned apple to Snow White, who falls into deep slumber as soon as she takes a bite. She is mourned over by all creatures that love her, and she is placed in a glass coffin until a Prince sees her and falls in love with her, awakening her with true love's kiss. Cinderella's friends are Bruno the Bloodhound, Major the horse, and many of the mice and birds. Snow White's friends include seven adult dwarfs, Doc, Grumpy, Happy, Sleepy, Bashful, Sneezy, and Dopey, and other forest animals. The antagonists in Cinderella's life include her stepmother and her stepsisters. The antagonist in Snow White's life is her stepmother, the Queen witch. Both Cinderella and Snow White had mean and envious stepmothers. Cinderella had mean step sisters too. Cinderella had a house and farm animals as friends. 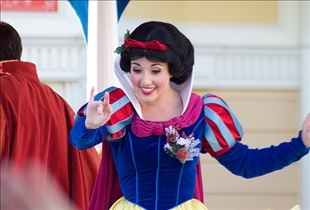 Snow White befriended forest animals and 7 dwarfs. Both Cinderella and Snow White are saved by a handsome and kind-hearted Prince. Which Disney Princess is better? something like this page for more than a hour .Thanks .very nice article indeed .